But I really want to know why? Why I never asked? Years ago, in the early 1970’s, Berts Towing would receive tow calls from local auto dealership body shops. 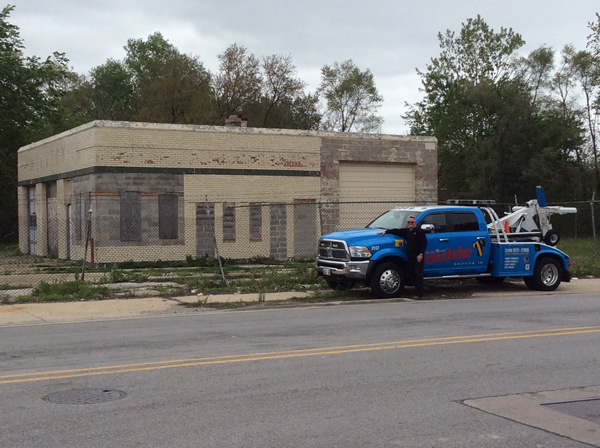 One of the pick up locations was a tow garage named 3J’s in Riverdale, Illinois. 3J’s was a typical tow company of the 1970’s, which was a gas station/repair shop with a couple of 1-ton tow trucks. (I assume they towed for RPD, but never asked!) As a young tow driver, in that era, crossing the state-line into Illinois from Hammond, Indiana seemed like a long distance tow, but in reality it was less than ten miles. Berts was busy every day with auto dealership tows pending; it always felt like you were daily chasing Father Time, and there was never enough of it! So when I would have a call at 3J’s, it was in-and-out with car in tow; I was never questioning about them or they about me–it was life in motion at a steady pace. Life in the towing business is always at a steady pace, but every now and then a tow driver needs to down-shift, and remember how we got to where we’re at today. For some reason or another 3J’s is stuck in my mind; if you read on, I’ll challenge; I’ll explain! John Hawkins II (20th Century American Attorney/Executive Director/Editor) was the Architect of the towing industry as we (Towman) know it today. John was a visionary who had the foresight to move the towing industry in a forward and positive direction. John’s salesmanship of his vision brought real unity to an industry bogged down with separatism. (At this time, in the mid to late seventies, there were a few state-wide towing associations; tri-state or regional associations; and the ITA [ICC authority permitted] association, but no industry-wide governing body.) I assume that John never owned a tow truck nor towed a vehicle; but he was a learned man, and a subject of the written word. 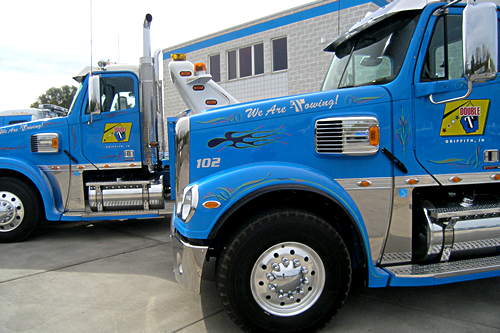 When John was introduced to the towing industry, in the late 1970’s, he began his march as the torch bearer of a nationally organized towing industry. John was the first executive director of the newly formed Professional Wrecker Operators of Florida, the first executive director of the newly formed Towing Recovery Association of America, Founder of The Friends of Towing, and a hugely instrumental personage in raising funds to start The International Towing & Recovery Museum in Chattanooga, Tennessee. (John was inducted into the International Towing & Recovery Hall of Fame in 1986.) I remember John driving up at Berts Towing, in a motorhome on a cross-country journey, to seek donations for his dream: a brick and mortar Towing Museum. ( Hell, if Val Reich III was riding with John it would have been two “poor ole peddlers.”) John’s merit, enthusiasm, and persuasion was very convincing; he left with fifteen thousand dollars — much to our chagrin! It was probably the best investment the Bertagnolli brothers ever made; John was true to his word! On the flip-side, our worst investment, or lack of, was not taking John’s advice on investing in his newest idea: Tow Times. John Lehman (20th Century American Entrepreneur/Towman/Publisher/Editor) was the Architect of Phootnotes, a towing and recovery monthly newspaper publication started in the early 1990’s. John was a learned man, and a subject of the written word; his articles in Phootnotes focused on his knowledge of the towing industry. (John was the owner/operator of Big Towing Company in Peoria, Illinois.) I recall one of John’s clever yesteryear editorials called: “Remember the Wave.” If I remember correctly, John’s storyline dealt with Corvette owners’ acknowledgement when seeing each other in passing on the roads; they would “wave.” It might be just an elevation of the fingers and hand while still securing the wheel with your left palm, or a full blown hand signal; but it was a sign of respect among the brotherhood of Corvette owners. John, I guess, thought that it would be a cool towing thing too; his article promoted the “wave” acknowledgement that tow drivers would show the same type of respect and brotherhood, thereby doing the same thing. I think the tow drivers’ “wave” kind of caught on from that point forward. It seemed like, in those early golden years of towing, you knew everybody including their brother’s brother. Times were good during those years; the economy was good, and it seemed like easier times — no pressure; if there was it never felt like it! The “wave” thing was the “thing,” a kind of Towman respect for one another. But something happened in the 21st Century, and the “wave” kind of fizzled out. Maybe it was 911, the Recession, new drivers with no historical knowledge of the towing industry, or maybe business related cost, such as: the high price of equipment, truck insurance, workman compensation insurance, health insurance, rent/property taxes, fuel, tires, repairs, wages, payroll taxes, and just about every possible expense that John calculated in his cost/price analysis article of a light-duty tow; or maybe, just maybe, no one seemed to care anymore. Or was it a change in the culture of the way we tow company owners acted and presented ourselves in front of our drivers. But drivers do care; and as Towman they should! It was evident on Wednesday, April 22, 2015, when nearly 100 Towman from Illinois, Indiana, Tennessee, and Florida driving tow trucks of all brands and sizes, participated in fallen Towman, Rickey G. Oliver’s funeral procession. Fellow Towman did this as a tribute and show of respect for his 40+ years as a wheel-man for Ace Garage, Berts Towing, Boulevard Sales, Wes’s Towing, and Double T Towing. The might of his funeral procession was a powerful and moving experience for all whom witnessed the brotherhood of the towing industry in force. The power of the written word (sent out by I.T.W.A., P.T.R.O.I., and Tow Times), and the power of the internet, foremost Facebook, got the news out and the responses were overwhelming. Two videos, one of the tow trucks lined-up and the second of the funeral procession itself, had almost 50,000 views. I told my Towman (past and present), their wives and girlfriends whom participated, that this expression of respect was a moment in one’s life that will always be remembered. But the power of the written word, and it’s new medium Facebook, when not acknowledged properly, can cut deeper than Zeus’ Thunderbolt! So here’s challenge Number 1: All Towman should refrain from posting disparaging remarks and comments on Facebook and social media against: transportation companies and their drivers; truck and wrecker manufacturers, their products, and their employees; distributors, their products, and their employees; tow companies and their Towman; and all associate members of the towing industry. It’s a national problem; it’s contagious; and it’s a cancer to the Towing Nation! We are all guilty, no exceptions, and it needs to stop! Competition is one thing, we as tow company owners know this and I’m sure each and every one of us welcome the challenge; but Jousting, Jealousy, and Judgement are not acceptable, nor should they be–it reflects on oneself, ourselves, and the towing industry as a whole. If the towing industry, as a whole, wants respect then Towman and tow company owners have to change the culture of the way they and their industry shows up! “We didn’t start the fire,” (Billy Joel) but for some unknown reason, we keep fueling the fire! If you remember any of my written words — remember this: Respect is bestowed upon you “because your peers relegated it to you.” (Beau Hamilton) Respect is not purchased, accumulated, gifted, or bequeathed by family lineage nor anything else! It is nothing, if you are nothing! Challenge Number 2: All Towman, young or old, do not be afraid to ask the questions that you want to ask. The next time you attend a Trade Show, whether it’s the Great Lakes Regional; Tow Times; American Towman; or any of the great state sponsored Trade Shows, ask the questions that I never asked when I was a very young tow driver years ago. The veterans of the towing industry will love to tell their story, their history, and the history of the industry we all cherish. They might even tell you any of the secret meanings in their company logo or coded messages used around the shop. Those conversations could and should be a rewarding moment for both of you. If you ever meet an old veteran from Oldenberg’s Towing ask them what “man-on-the-roof” refers to — it’s pretty cool. There’s a lot of history, funny stories, and memorable moments that us towing veterans will share. It’s not all about the big wrecks, pictures, and Facebook posts; it’s about who we are: Towman — one and the same; whether we like it or not — we’re connected like brothers! We (Towman) proved that on April 22, 2015, and the Towing Nation saw the 50 thousand results of our brotherhood. Towman — let’s keep that fire burning! 3J’s is gone, but not forgotten; the building still stands, vacant, weathered, and the victim of Father Time and economic disparity. I’ll never know what 3J’s stood for, maybe it was nothing but a name; but maybe it had significance, and to them it probably did — just like the name of the tow company that each of us owners’ have named, or our fathers’ named. One day, we’ll all be gone too, maybe forgotten, maybe not. (I always said, “that I’d take that 750 to the heavens.”) The “Author” has us all in His Book. Two weeks ago a friend said to me, “we just don’t know the where, the when, and the why.” And maybe, just maybe, one day there will be an old Towman, whom was once a young Towman, who will remember us, the once modern-day Towman of yesteryear, as the game-changers of the 21st Century. Not God’s; and not the beast.